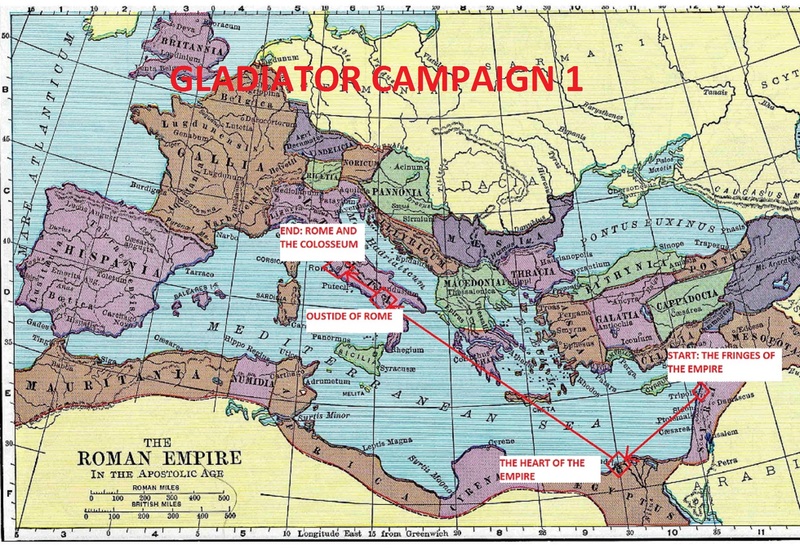 The Last Romans: the megagame. 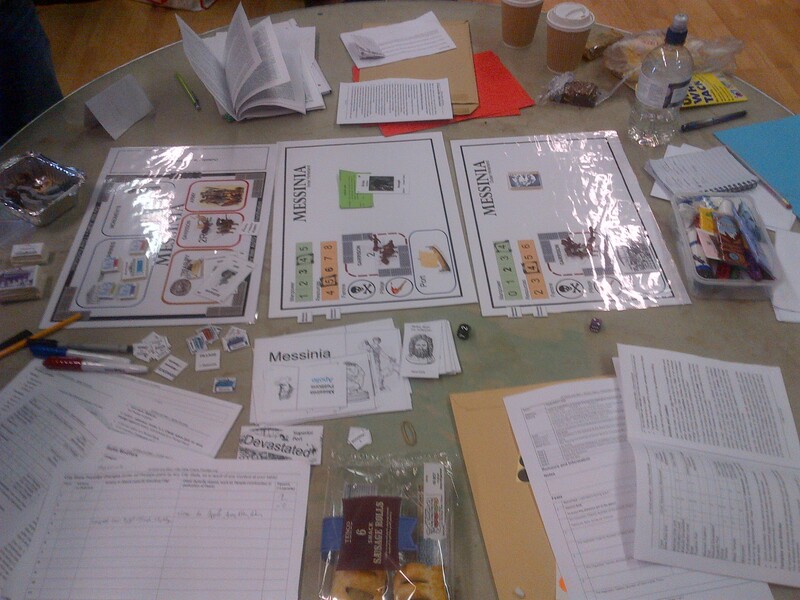 Last weekend saw the final game in the Pennine Megagame calendar: the Last Romans, designed by Paul Howarth. Set around the Mediterranean during the reconquest of the west by the Byzantium general Bellasarius. My role for the day was the control for the Sassanid empire, I was lucky to have a great team of players to watch over. 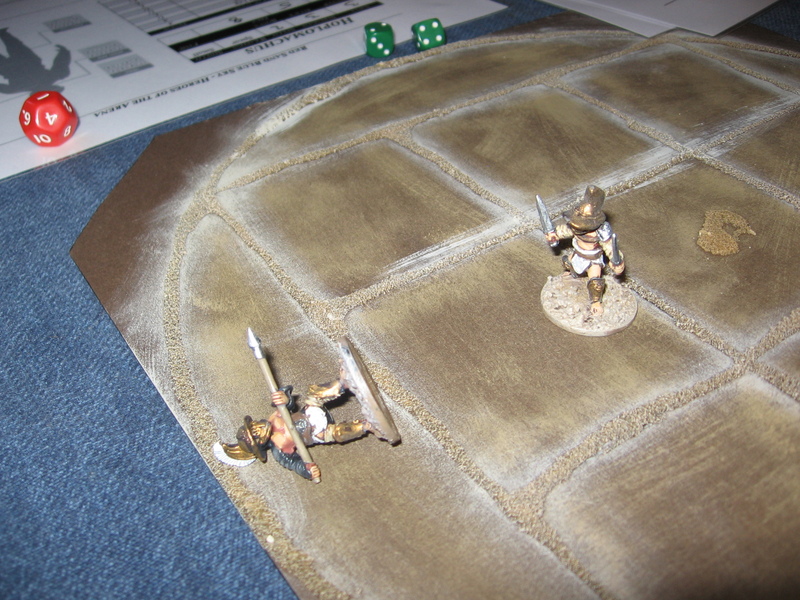 Other teams covered the various outposts of governors of Justinian’s empire, Visigoths, Ostrogoths, Franks as well as a separate court and Constantinople game; making for a 50 player game. Play started with the eternal peace between Justinian and the Sassanids in force, for which the Byzantiums were paying gold every year to keep. This meant for quite initial turns for the Sassanids which allowed them to build up their army. Some combat experience was gained by attacking the Arabs to the south and the barbarians to the north. One general went incognito to lead a barbarian army to gain some experience in the rules system. Most of my day was spent checking the administration of the portion of the Sassanid empire that was in the game, using a simple control panel and a worker placement system and also deal with any public works that were being built, competition to out do other teams in both quantity and gaudiness (much glitter was used) was very much in evidence. Other than that is was the usual round of adjudicating on rules queries and making sure battles ran smoothly once the fighting between the Sassanids and Romans started. It was the Romans that broke the eternal peace first and then the counter attack by the Sassanids proved quite strong. Their ambassador player, was so silver tongued that he managed to exact heavy reparations from the new emperor for breaking the treaty even in the face of ongoing counterattacks. A plague event, that even killed Justinian, did mean that the Roman provinces at the eastern end of the Med suffered badly, so much so that by the end of the game they were looking to be subsumed in the Sassanid empire as vassal states, such was their neglect by Constantinople. My duties to the Sassanids meant that I was pretty ignorant as to what was happening in the rest of the game, I couldn’t tell you anything, for example, about the very popular Chariot races and entertainments that were a big part of the Constantinople game. 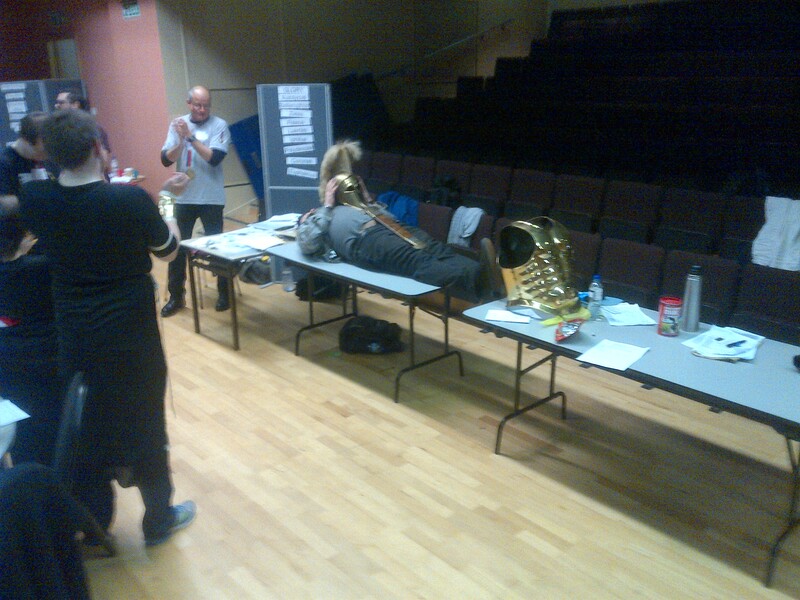 However, everyone seemed to enjoy themselves so it was a good way to round off a very good year of Pennine Megagames. Looking back on my plans from this time last year I can see that I only achieved one of those goals and that was only in the final week of 2014… still I consider those projects still on the go. However some new things have caught my interest…. 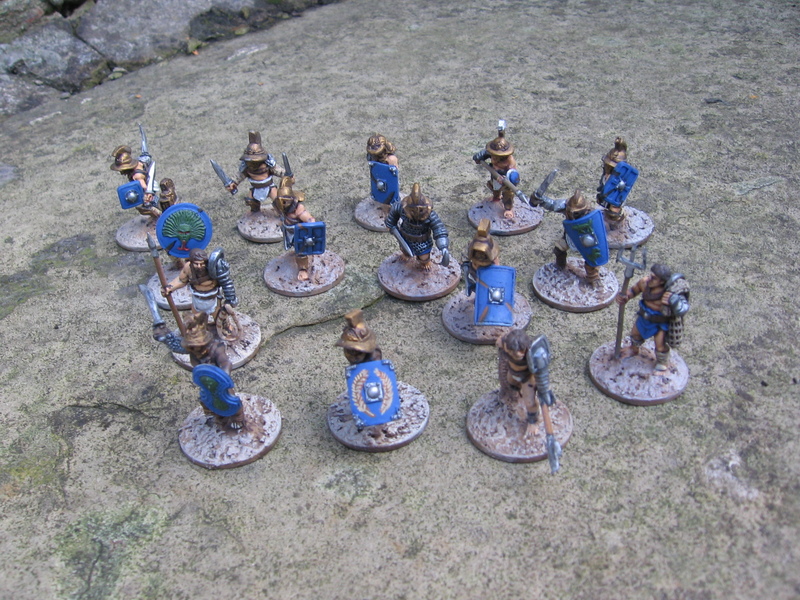 Firstly I’ve really enjoyed both painting and gaming with the Gladiator figures so I think I will get a few more ancients figures for some skirmish games, no more than 20 a side to keep it simple. 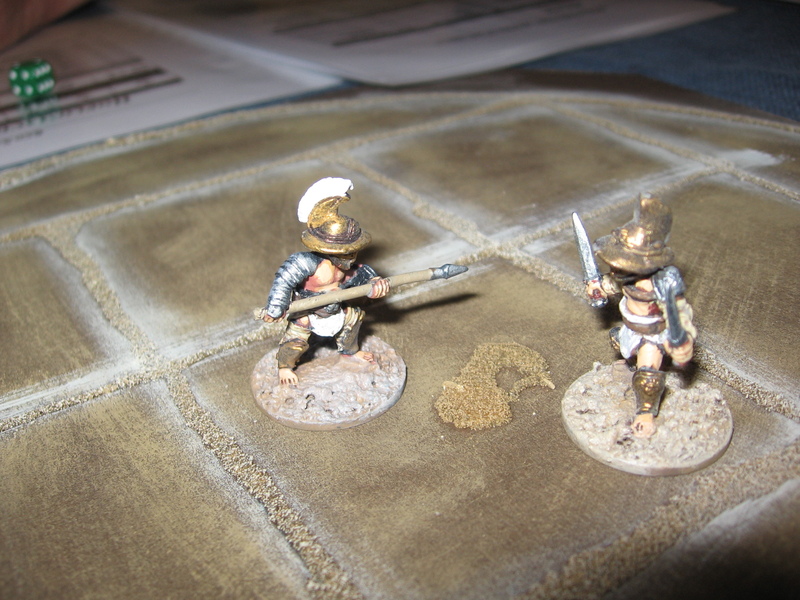 I’m drawn to Thracians as they are my favourite tribe and they have plenty of potential for gaming scenarios. Will pick up them and some Celts first probably. 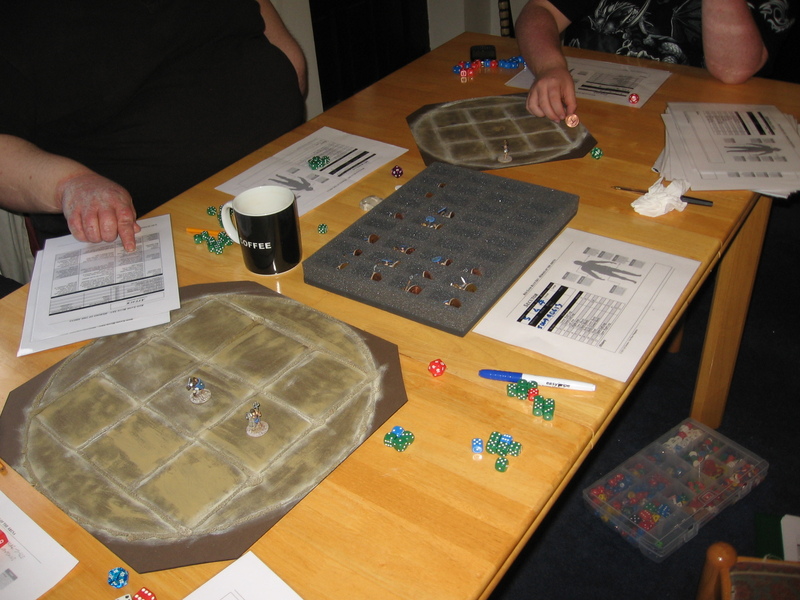 Secondly I’d like to play in more campaigns. The Gladiator one was great fun and I’m keen to start the Ludos one (previously we only played a single gladiator). I’m running a PBEM WW2 game for Brian and Evan and hope to do some more in the future- possibly with other people too. Thirdly I’d like to do more SF gaming- quite what and how remains to be seen, probably skirmish games possibly RPG, I’ve always had a fondness for the Post Apocalyptic genre but I seem to be revisiting the Cyberpunk literature of my teenage years so maybe something along those lines. That should keep me going for a while. See what I pick up when I sell some old stuff and visit the forthcoming shows. ‘Of Gods and Men’- Megagame, Royal Armouries, Leeds. Yesterday saw myself, along with Brian, Chris and Evan, go along to the Royal Armouries in Leeds for another megagame. After the viral success of a video made by the ‘Shut up and sit down’ guys the megagame concept has generate a lot of interest, so much so that this game had to be expanded to cope with the massively increased demand. Also it was a first for me as I had been given an umpiring role for the first time… which to be honest I was fairly pleased about as it was something I was wanting to try at some stage. The city state of Messinia- consisting of the city and outer and inner hinterlands. Apologies at this point for the rather poor photos- they were taken on a smart phone (and elderly and crap one at that). The game was set in classical Greece, the time of the Homeric legends, rather than a purely historical idea; there were Five gods represented in the game, each with three players, nine heroes, each played by an individual and them eight city states played by teams of four. As you can see a large game. I was umpire/ control of the city state of Messinia, they had to compete with the other city states to gain the most prestige, to achieve this they could trade, build civic structures, and conquer land. With am emphasis on fighting it would prove useful for them to recruit Heroes to lead their armies, the heroes were keen to do this as it increased their personal glory, for they were in a parallel game to compete for the highest total, they also had their own quest to complete, I heard rumours of a golden fleece but it never appeared in Messinia, as well as defeat a variety of rampaging beasts that appeared at the whims of the Gods, Speaking of the Gods the mortal players had to placate them by building temples and monuments in their honour and dedicating great victories and quests to them. This fed back into the game they were playing as well. As you can see there were effectively three games in one, or possibly more accurately three parallel games going on in the same world. I say this as for while one group of players needed the other they only really wanted the help they could get out of them for their own ends. 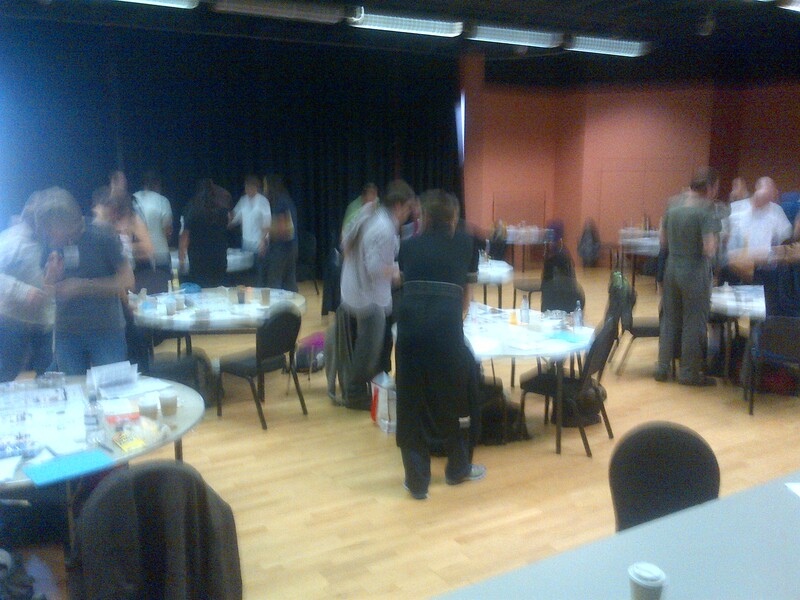 A blurry shot but it gives you an idea of the busyness of the hall. As control for Messinia my duties consisted of managing all game events that happened in that city state- mostly economic as it turned out as whilst they were attacked on the first turn for the rest of the game they managed to keep any further violence on foreign shores. However Messinia did have its own fair share of beast plaguing it, including a rather troublesome troll, which saw a succession of Heroes turn up to dispatch them for Messinia for not just the glory but extra rewards that helped them, or else a promise to come back and help Messinia further. Evan took on the role of one of the Heroes but never had anything to do at my table so I didn’t see much of him through the game. Chris and Brian took on the roles of different aspects of the Gods so likewise I didn’t see much of them in game as the interactions between Gods and mortal was very limited, unless the God choose to physically manifest themselves to influence the game. A rather large punch up- two different Gods manifested themselves for the fight on opposing sides, the result saw the sacking of the city state of Argolis. The Messinia players had a rather slow start as they were more concerned with getting a solid economic base set up than with pursuing an aggressive foreign policy (they did get some rather stiff prestige penalties for not attacking early on) however this did hold them in good stead for the reminder of the game as they seemed to have far more money than anyone else. As an aside I was very surprised that none of the other city states tried to attack them more, especially to try and take out the gold mine they had established. 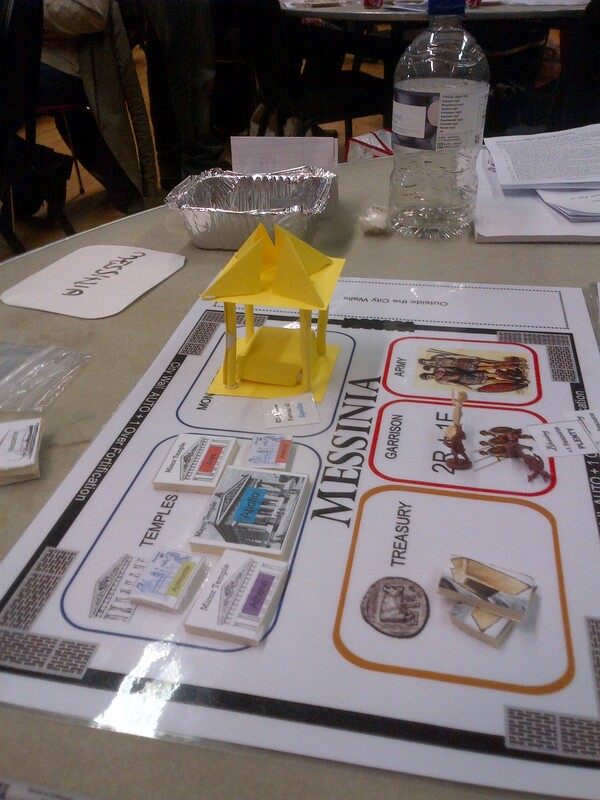 At this point of the guys the lads of Messinia had more gold in their coffers than everyone else put together. Not the rather impressive monument. Given the size of battle that was being fought on other tables it would have been fun to run an epic struggle at my own. Ultimately though the lads only placed fourth in the over all rankings, but as they had come from dead last it was an impressive achievement and I think that the longer the game went the high they would have gone. 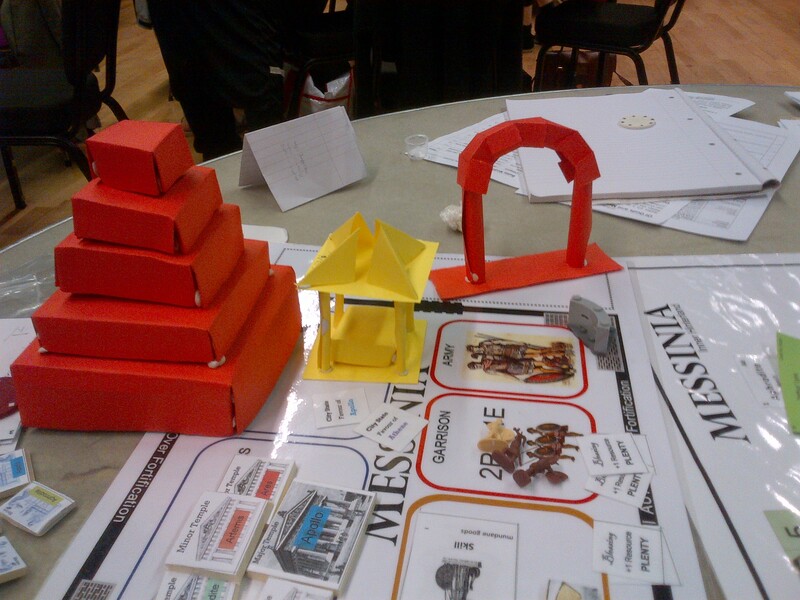 The impressive monuments didn’t stop at the yellow pagoda of Ares, but incorporated the step pyramid of Aphrodite as well as the finished but undedicated at the end of the game archway. Given all three monuments were constructed with just card, blutack and a Swiss Army knife everyone was rightly rather impressed by them. Some heroes did die in the making of this game. After the game people headed to the pub for a post- game pint and informal debrief, which adds to the whole experience imo. 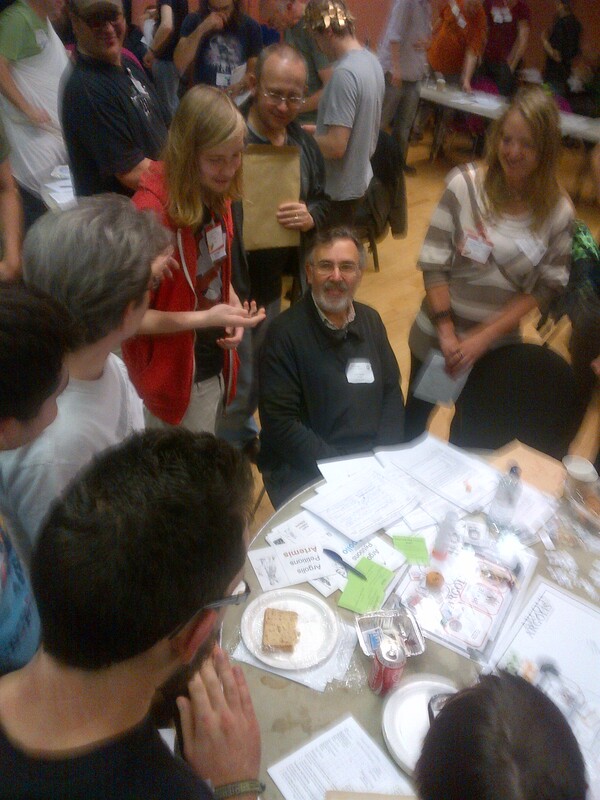 So all in all another great megagame and I’m already looking forward to the next one.